Home › Digital Songbooks › Aftertones - Digital Songbook feat. "Love Is Blind"
Aftertones - Digital Songbook feat. "Love Is Blind"
Look Inside! 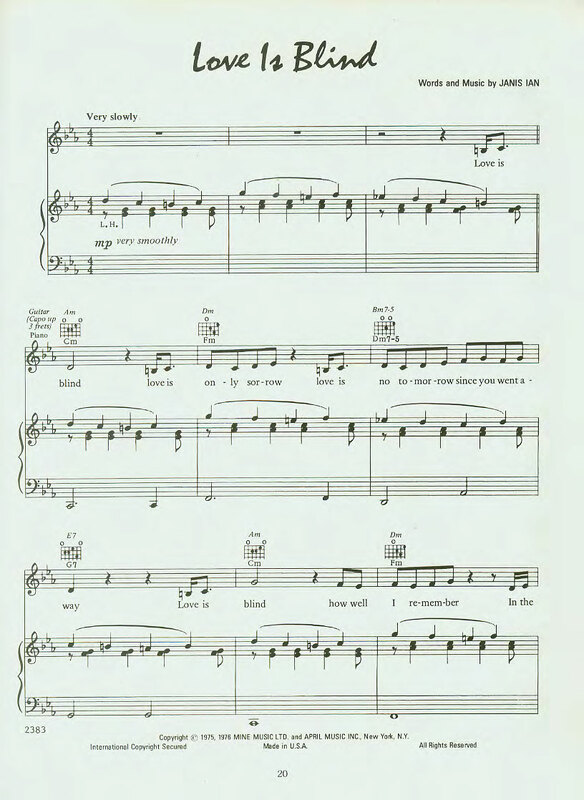 CLICK HERE to view a page from the songbook. This songbook has been faithfully recreated with modern technology to ensure that the transcriptions are as legible as possible! Transcriptions personally supervised by Janis. The songbook is delivered in Adobe PDF format. You will need Adobe Reader or Adobe Acrobat to view it. Some facilities, such as Kinko's, may have a problem reproducing this due to copyright concerns. Please note that there is a "Permissions" page in the songbook that allows the purchaser to make one high quality copy - just show them that! If you have any problems with your order please contact us at merch@janisian.com. We'll get things straightened out very quickly. Janis Ian - Digital Songbook feat. "Society's Child"
Folk Is The New Black - Digital Songbook way ahead of its time! Miracle Row - Digital Songbook feat. "Party Lights"